Manufacturing sheet metal parts, plastic parts, insert mouldings, gears, wire harness, hardware and stickers. Also offering press job work and sheet metal die design consultancy services. 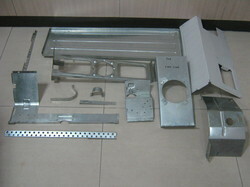 Sheet metal parts for automobiles & white goods industry. We can cater to any other company requiring the sheet metal parts.